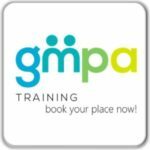 The event started with GMPA’s Directors Graham Whitham and Tom Skinner talking about GMPA, what we seek to do, some highlights from the last year (which regular readers of the newsletter will be aware of), and our hopes for the year ahead. Graham also talked about Joseph Rowntree Foundation’s UK Poverty 2017 report which had been published that morning, and that highlighted 14 million people living in poverty in the UK – over one in five of the population. 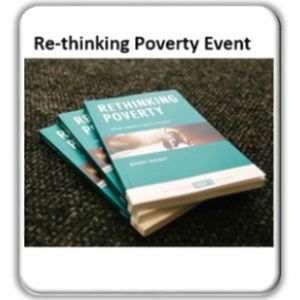 Our first guest speaker was Barry Knight, Director of the Webb Memorial Trust and author of Rethinking Poverty. He outlined the challenge that our society faces in reducing poverty through existing paradigms, and invoked Beatrice Webb in his insistence that poverty is a function of social structure and economic mismanagement, not individual character failings. 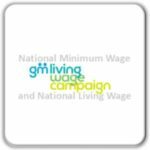 The two decades immediately after WW2 were characterised by full employment and a comprehensive welfare state safety net but we now face threats from the likes of automation, low wages and low public spending. He said that policies should not focus on economic growth, but ensuring a basic standard of living, allowing people to participate in and contribute to society, and characterised by intergenerational fairness. In particular, it’s critically important that young people and poorer people work together and make their voices heard; change will only come from the bottom up. He concluded by calling for triple devolution: power should be shared by national government, regional and local government, and communities themselves. Local authorities should devolve power to local organisations which have a broad base of community engagement, especially involving young people. A good society, without poverty, will not come from top-down redistribution, but through new transformational relationships based on mutuality. Andy Burnham, Mayor of Greater Manchester, spoke next, and said that devolution offers major new opportunities to rethink politics and poverty. He agreed that real change will come from the bottom up, not from Westminster, so Greater Manchester has the opportunity to make changes and inspire others to do the same. He shared a tragic story about the death of a young homeless man whom he had known. Society is now deeply unequal, not just in relation to income/pay but also in experiences of insecurity. The rise in demand for mental health services reflects this increased insecurity. He urged us to question high pay as well as low pay, and inequalities within organisations, as well as between individuals. He said that he is committed to ensuring that the cynicism that people feel about Westminster politics should not be replicated locally; indeed, devolution offers an opportunity to correct the problems created by Westminster. We therefore need to demonstrate new approaches, and show that change is possible. • Universal Credit – Andy said that some of the DWP budget should be devolved to GM. 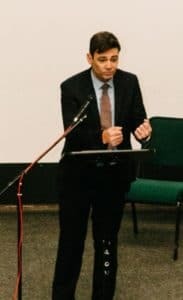 A suggestion was also made from the audience that credit unions could play a role in helping to address the long wait for UC to come through that is putting many people into rent arrears, and Andy expressed a willingness to explore this possibility. • Universal Basic Income – Andy said that evidence from the pilot in Finland will be important, and said that as well as income, other issues need to be factored in for real poverty reduction, e.g. in housing, security of tenure, quality of housing and rent controls for people in private rented sector. We then welcomed Young Manchester, two of whom gave powerful speeches about the impact of poverty on young people, told us about their Poverty Speaks Volumes work and presented their video: watch it here. Finally we had a panel discussion with Jayne Gosnall, Salford Poverty Truth Commissioner, Dr Carolyn Wilkins, Chief Executive of Oldham Council, Barry Knight who had spoken earlier, and Paul Dennett, City Mayor of Salford Jayne, Carolyn and Paul each gave short speeches reflecting on the other talks and presentations. Jayne talked about the principles behind the Salford Poverty Truth Commission and the outcomes, such as making council tax bills easier to understand, information about what to do if struggling to pay the bill, and free replacement birth certificates for homeless people. Carolyn said that Oldham has been working differently for some years, after rethinking its fundamental purpose: not just service delivery but also economic development, listening to people’s lived experiences. Paul said that poverty is a systemic issue and a symptom of the failure of neoliberalism, and that we need more progressive taxation. 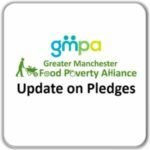 Poverty cannot be addressed just through local actions, but devolution presents an opportunity to challenge the highly centralised UK government. He said that we need to campaign for social justice, further devolution and local democracy. There was then a lively discussion with questions from the audience. We finished with some final thoughts from Graham, and “I don’t want to live in poverty”, another powerful song from Young Manchester. All of the speakers, and the audience who asked questions, complemented each other well and we explored many challenging questions and innovative approaches through the afternoon. 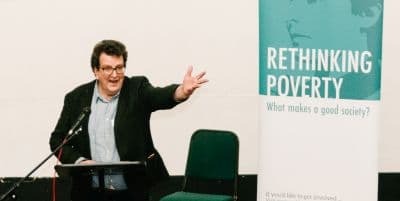 It really was an event in which we rethought how to address poverty here, and how Greater Manchester can lead the way in the UK.